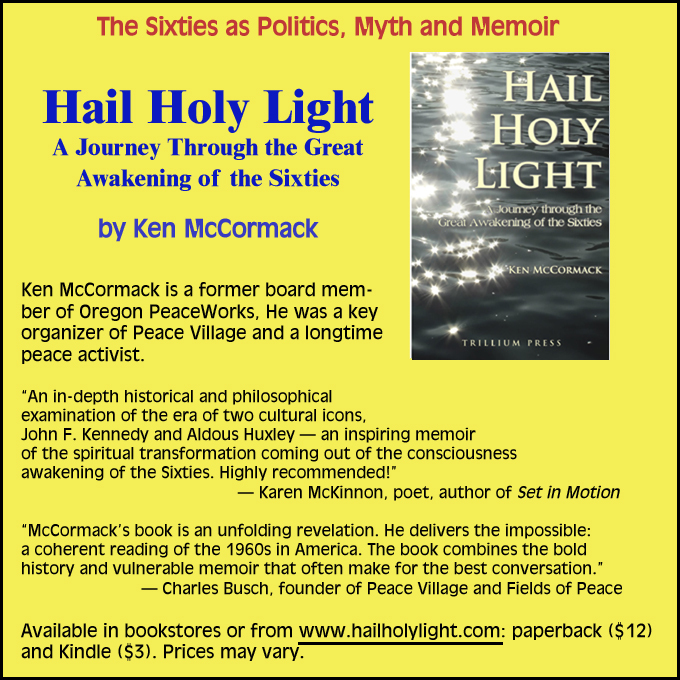 Book Review of Hail Holy Light – A Journey through the Great Awakening of the Sixties by Ken McCormack. The title of the book is true to the author’s intent: to explore both the historical and the psychological-social-spiritual events that took place in the 1960s. He makes this exploration personal; a memoir of his own journey and “healing” — from his old self to his new one. Among his life experiences, Mr. McCormack attended the University of California at Berkeley as a Woodrow Wilson fellow. He describes himself as “politically active” in the civil rights and peace movements of the 1960s. More recently, he has served as an associate editor of The PeaceWorker and as a Board member of Oregon PeaceWorks. Are We as “Awake” Today? The book’s title was the product of a quote by the renowned poet John Milton. Like Milton, Ken McCormack is a deep thinker, and he presents an engaging perspective on the tumultuous times of the 60s. Craig Cline is a member of Oregon PeaceWorks and supports its mission to help create a world where peace and justice reign.